Description: NS Southbound Intermodal Train at Woodlawn, Al. Description: NS 143 rolls through downtown Marion on a Hazy Monday evening. Description: Hooking up to his train in the UP yards. Description: The last of three units on this train. Description: Does anyone have any idea what that is? Description: L42 waits for the signal at CP79 to start its southward journey. Description: NS SD70 2513 was the second engine on this eastbound freight. Description: Westbound stack train with a UP Dash 9 in second. Description: Westbound on track two with a UP widecab trailing. Description: 13G comes out of the fog at Mattawana. Description: A half hour later 33A comes down the line with an EMD and a trio of GEs trailing. 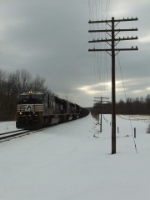 Description: An SD70 leads 11J west through Emmaus. Description: An eastbound at West Lake Rd. is headed upgrade on Transfer Hill on its way to Meadville for a crew change. Description: Eastbound coal rolls under the B&LE High Line at MP 126. Description: Eastbound coal sluggin upgrade through Atlanic. Description: Eastbound NS coal train approaching Atlantic Rd. Description: Overcast skies present a background for M9G, slowing to meet 18G(a disaster).